I've been out for over a week. Had a big medical issue come up, with long hospital time. I'm back now. There are changes taking place, most of which I don't need to share with everybody, 'cuz while they're important to me, they won't matter to most folks. It's enough to say here that I now need to monitor a medical thing in my life, at least for a while, that isn't obvious to anybody. Most of the time, not even obvious to myself. But here's something related to that, that I think is important enough to share. I'd like everybody to meet Boomer. If I'm able to train him fully and properly-- And I will. Dog training is one of my life-time hobbies.-- a lot of people will meet him personally. He has a role in my life now, to warn me of small medical effects. More in a moment. Boomer was a gift from my sister Anne, who breeds Australian Shepherds. For some reason, she wasn't able to sell this pup. So last Christmas, here was my gift from Anne. I didn't really want him, but took him anyway. Family thing, you know. 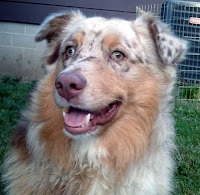 In Anne's heart, she was replacing my previous Search and Rescue partner Titan, an amazing Aussie that also had come from her kennel. But Boomer's Search and Rescue drives are somewhere between none and zero. Same for his herding drives. I can't say that he has any special traits except for just being a lover. He's a big-time lover. Last night in my bedtime prayer, I asked God to give me some sign if I should elevate Boomer to be a true "Companion Dog." This morning, when I woke up, I was calm. I just opened my eyes. No stretch. No noise. No motion. No thoughts in my mind. Boomer stood up and walked to my side of the bed. He set his chin on the bed next to my face, and looked at me. Then he stepped back and laid down on the floor. Boomer will be a year old in just over a month. His training involves teaching him to hold by my side and be calm no matter what, no matter where, to every person we meet. He's over halfway there already. God knows our needs long before we do. He knows what is going to happen far in advance, either by natural flow or by His intervention. And many times, He fills our needs before we even have them. In this case, He had my sister give me a puppy who would be the exact correct age when this change in my life happened. So say "Hello!" to Boomer, everybody. And thank-you, Lord, for meeting my needs before I even know I have them.